Virtual Reality (VR) camera technology and viewing experiences present new horizons in documentary storytelling. At the Vermont Folklife Center we are exploring the application of these new technologies in the field of folklore, ethnographic research, and cross-cultural storytelling. We often describe ethnography as the process of working to understand an experience from the perspective of the people or cultural group to whom that experiences belongs. In other words: attempting to see the world from the perspective of another. The experiential implications of Virtual Reality (VR)—transporting someone “virtually” to a place in time—presents ethnographers with an immersive documentation and communication medium unlike any available to us before. 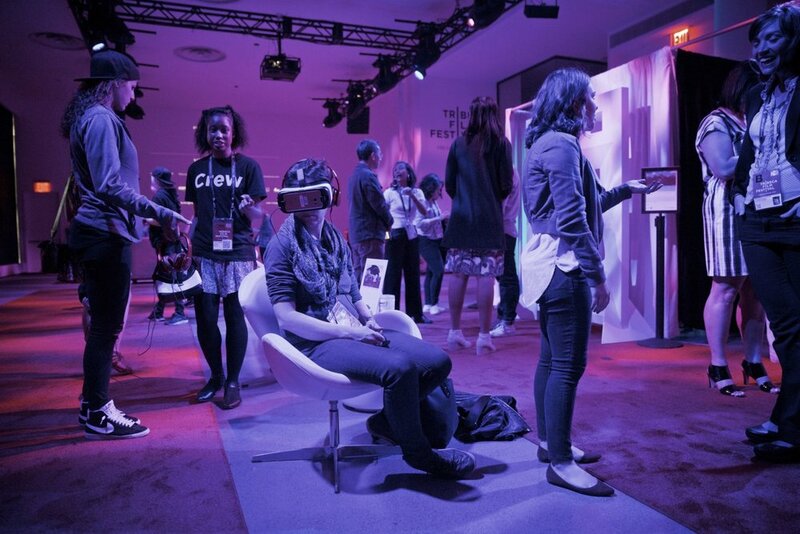 At the same time, VR also caries many unexplored ethical and professional questions. The Vermont Folklife Center wants to be at the forefront of testing this new terrain. Our VR activities are a part of a larger strategic initiative to increase statewide engagement with the Vermont Folklife Center through innovative approaches to presenting our work to the public. VR is one among several projects serving a central role in this effort, which also includes the use of storytelling media such as comics, short and longer format documentary films, traveling exhibits, our podcast Vermont Untapped, and more. The Folklife Center is currently producing four VR films stemming from our ongoing fieldwork on local agriculture, ice fishing and New American Nepali cultural traditions. In 2018 we plan to complete these films and begin to disseminate them as widely as possible both online and in person through a network of statewide partners and events. VR represents an exciting opportunity - for the Vermont Folklife Center and for everyone interested in the cultural heritage of our state. We seek to raise $20,000 in order to realize our vision. Crucial discussion and exploration of the ethical considerations of VR in the field of folklore and ethnographic research. Deeper engagement with the methods of working with VR. Research, interviews and other fieldwork activities with the communities featured in the films. Exploring and establishing ways to broadly share our VR films online and in person, including the purchase of VR viewing equipment and hardware, VR film hosting, web presentation, marketing, and the costs associated with presenting these films across the state. We have been researching and testing VR camera technologies for over a year. Below are a collection of test films and raw clips from the VR films we plan to produce in 2018. IMPORTANT NOTE: To watch the clips below you simply open them in your web browser, hit play, and then click and drag on the video screen to change the viewing perspective and experience to the 360 degree view. When the film is watched inside a VR headset the accelerometer in the headset tracks the viewers motion seamlessly, so that as the viewer turns his/her head, they have the experience of looking around the scene. Raw footage from the 2018 Ubhauli Sakela Festival hosted at Battery Park in Burlington, Vermont by the local chapter of the Bhutanese Kirat Rai Organization of America. The festival - once believed impossible to host in Vermont due the difficulty of obtaining special musical instruments and other culturally significant items - drew communities across the U.S., including Maryland, Massachusetts, Ohio and Pennsylvania. A short clip filmed from the center of the dance circle during the festival. Filmed this past winter at "The Meadows" in Brattleboro - the following is a raw clip from a day shadowing avid local ice fisherman, Chad Ives. Raw footage from test footage at one of the two farms that will be featured in our "Growing Food, Growing Farmers" VR films. The clips below were filmed at Dorset Peak Jersey's with the help of Caleb Smith and his daughter. Bottle feeding once of the calves. Testing VR camera attachment and stability on moving machinery- Caleb spends 1+ hrs a day using this forklift. While VR is an emerging technology, we have researched and tested how other institutions are presenting VR experiences to help inform how we will present VR at our center in Middlebury. One model institution we visited is the Phi Center in Montreal, CA - which presents a library of VR film in their, "Virtual Reality Garden." The introduction to the short film below shows visitors using their "Garden"--and while their space is more extensive than we are planning, the short film effectively conveys the experience of on-site viewing. A short introduction to the VR experience, made by the Phi Center in Montreal, CA. We are seeking "seed funding" to make all of this happen - we do see this as an investment, not in financial return, but rather in the continued learning and capacity-building of these emerging research and storytelling platforms. At the Vermont Folklife Center we are working "to make Vermonters visible to one another" - and we're excited to explore how VR will help us foster empathy and connection between Vermonters in new ways. Thank you for considering this project! For more information, or to donate, contact Director of Development, John Barstow, jbarstow@vermontfolklifecenter.org or by phone, (802) 388-2145. 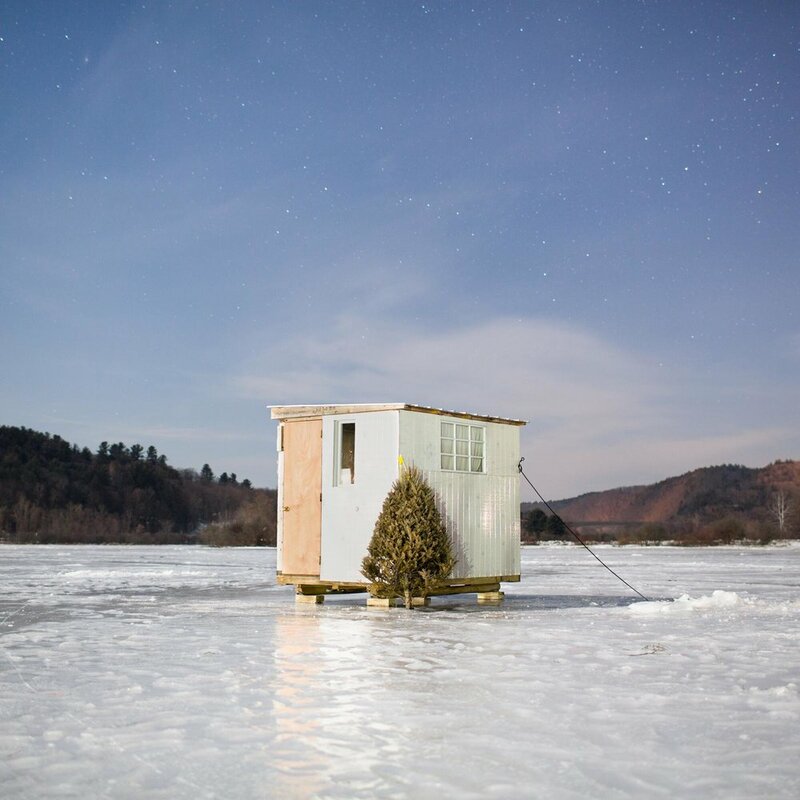 Ice Shanties is an exhibition about the structures, people, and culture of ice fishing seen through the lens of Brattleboro-based photographer, Federico Pardo. Pardo’s large format color photographs of ice shanty structures at “The Meadows” in Brattleboro, Vermont are paired with audio reflections from the shanty owners - drawn from interviews conducted by the Vermont Folklife Center. The Vermont Folklife Center is seeking support for the production of the Ice Shanties exhibit, which will open at our Vision & Voice Gallery in early 2019 and then travel to our partnering venues across Vermont. 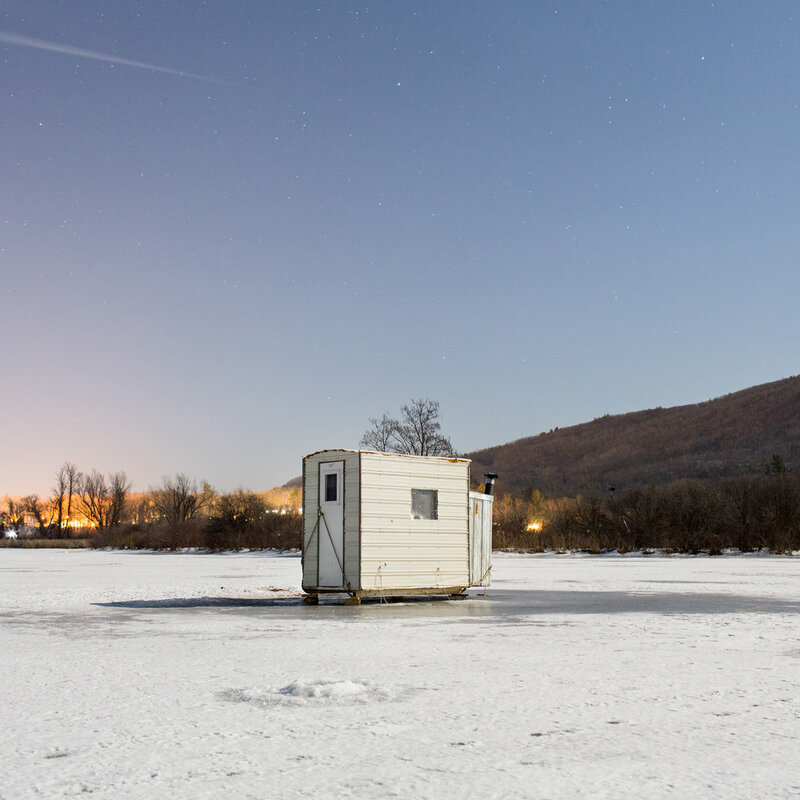 The exhibit features nine large format (36in x 36in) ice shanty portraits by taken by photographer, Federico Pardo, during the 2016 and 2017 winter fishing seasons. The portraits were shot at twilight/night using long camera exposures that create a surreal quality of daylight and starry skies. While Pardo's shanty portraits provide a visual entrée into the material culture of ice fishing, interviews conducted with shanty owners by Vermont Folklife Center provide an opportunity to engage with the human side--the personal, familial, and recreational culture--of this seasonal outdoor activity. Audio excerpts drawn from interviews with the shanty owners will be available for listening in the gallery. See below for a sample audio excerpt from shanty owner, Roy Gangloff. In conjunction with the exhibition, the Vermont Folklife Center will release a short virtual reality (VR) film about Chad Ives, one of the fisherman whose shanty is featured in the exhibit. Using VR headsets available at the gallery, visitors will be immersed in a 360 degree video environment and follow Chad during a day of ice fishing at The Meadows in Brattleboro, VT.
See below for a sample clip of raw footage from the film. Your support of the Vermont Folklife Center makes exhibits like Ice Shanties possible. Please give through the online donation portal here, or contact Director of Development, John Barstow, jbarstow@vermontfolklifecenter.org or by phone, (802) 388-2145. The Folklife Center is currently producing four VR films stemming from our ongoing fieldwork on local agriculture, ice fishing and New American Nepali cultural traditions. In 2018-2018 we plan to complete these films and begin to disseminate them as widely as possible both online and in person through a network of statewide partners and events. VR represents an exciting opportunity - for the Vermont Folklife Center and for everyone interested in the cultural heritage of our state.